Compact design makes this stool ideal for use in small spaces where extra seating is needed. Ideal for doctor's offices, schools, offices, warehouses, and more. Upholstered in durable vinyl for easy maintenance and cleaning. Pneumatic height adjustment for easy operator positioning. 5" thick and 14-1/2" diameter cushion provides firm support that softens and contours to your body over time, ensuring a comfortable cushion for a long period of time. Comes with a removable backrest for maximum comfort and versatility. 2" Hooded Dual Wheel Caster. 5-leg plastic base with steel seat plate. Easy to assemble. 1 year limited warranty. 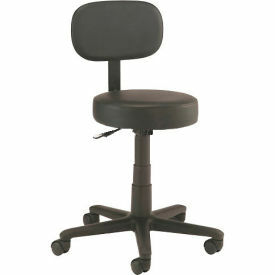 Optional stool glides also available to replace casters for stationary use - check model# 506818.